For He is Good and Loves Mankind: What the media is doing to Ron Paul is criminal. I apologize in advance for discussing politics on this blog -- it was not and is not my intention to speak on political matters except as they pertain to the Orthodox Christian Church. I make an exception today because I just witnessed one of the most ridiculous and biased "news" stories I have ever seen. This morning, George Stephanopoulos was doing a segment on the Presidential race, and the topic of discussion was Newt Gingrich's slide in the polls. That's all well and good, but then they began talking specifically about Iowa and how Gingrich was sliding and Romney was gaining. 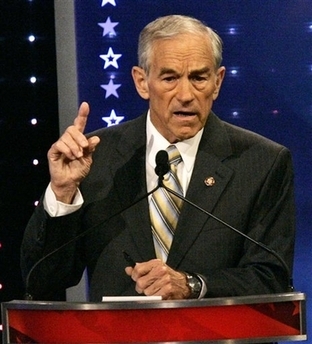 What they failed to mention was that in the last 2 polls out of Iowa, Dr. Ron Paul is leading. He has a very good shot at winning. They talked quite a bit about Sarah Palin, who isn't even running. But they did not so much as mention Dr. Paul's name. So why would that be? I've heard people talk for quite a while about "liberal media bias." I am going to posit that no such thing exists. Rather, we have a corporatist plutocracy in this country that wishes to control our economy, our government and our media. The notion that we have a free press is a cute story from a bygone era. We now have a bought and paid for press pimping a bought and paid for government staffed by bought and paid for politicians. Call this what you will, it is neither a Constitutional Republic nor a Democracy. Dr. Paul believes in limited government. Depending on your particular worldview, you may like that or dislike it. But the one thing he believes in over all else is that in questions of whether the federal government ought to do something, the Constitution should control. That separates him from every other candidate in the race and makes him a very, very dangerous man to the interests that currently wield the most influence in our country. He will not prop up corporations with tax dollars. He will not support the current military-industrial and prison-industrial complexes. He will not support laws -- even if he agrees with them -- that exceed the role of the federal government outlined in our Constitution as he understands it. And even if you disagree with where he draws those lines (as I do in more than a few instances), it is my opinion that this is a national discussion worth having. I make no bones about my support for Dr. Paul. I voted for him last time and I will vote for him again. But I do not write to endorse Dr. Paul nor to encourage others to do the same. I write to ask whether a system of government, economics and information that would ignore a candidate who is leading in the polls is a truly free society. I write to suggest that unless and until we as Americans are willing to vote for someone other than whomever the media trots out and the two major parties endorse, we will continue to devolve into a banana republic with no real freedom and no real choice. Please consider that when you make your vote in the upcoming primaries. I close with this now dated statement from Jon Stewart about the media ignoring Dr. Paul. Please note the language is colorful, so watch it at your own discretion. But the message Stewart gives is worth hearing. Happy anniversary of your baptism, too, David! Many years! Thanks for the well wishes, Jonathan. It's actually the anniversary of our Chrismation, but the sentiment is appreciated all the same. It's been many years since we had a free press in this country. It's just that now it becomes more obvious than it used to be. The giveaway is that they virtually ALL say or don't say the same things, have for years and years. This applies to "conservative" media such as Fox News AND to "liberal" media such as MSNBC. Anastasia, I trust that's correct. As much as it pains me to do so.